Many homeowners take precautions against criminals and break-ins by installing home security systems. Not every crook comes creeping in through the night, however. Some scammers may walk right up to the door and knock. How can you spot a home security sales scam and what should you do if you encounter one? One type of aggressive sales scam targets homes that already have a security system installed. These scammers present themselves as representatives or technicians for your existing home security provider and may offer to upgrade your system. Once inside your home, they switch out your equipment with their own. With their equipment now installed, they pressure you into signing a new, expensive monthly contract. Now you are responsible for two home security contracts – one from your legitimate provider and one from these scammers. How Can I Spot a Home Security Sales Scam? You don’t want to become a victim of this expensive home security sales scam. These scammers frequently use high-pressure sales and scare tactics to try and get into your home and dupe you into signing a contract with them. To protect yourself against these con artists, you can watch out for some key phrases such as “I’m here to upgrade your system” or “your home security provider no longer covers this area.” These are just a few red flags to keep an eye out for. Scott Alarm never sends security consultants to homes without an appointment scheduled with you in advance. If you do not have an appointment scheduled and someone comes to your door claiming to be with Scott Alarm, contact customer service to confirm whether the visit is a legitimate one. 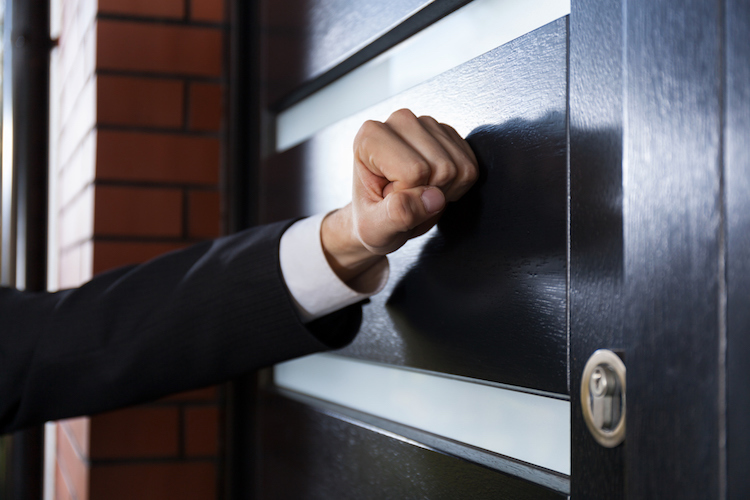 What Should I Do If I Think a Scammer is at my Door? If you hear a knock at the door and think you’re about to get home security sales pitch, try these techniques to keep the scammers at bay. It’s more difficult to make someone leave your home once they’re inside than keeping them from entering in the first place. If you’re uncertain, don’t answer the door. If you do open the door, and they persist or push their way inside, call the local authorities. Worried you may have simply forgotten a scheduled appointment? Verify whether the visit is legitimate by contacting your Scott Alarm customer service team at (888) 338-7233. If scammers visit your home, contact the local police and report the incident to the Better Business Bureau. You can also warn friends and family to alert them of the scam in case they receive these unwanted visitors. Scott Alarm is your trusted Jacksonville home security provider. For your free security consultation, contact Scott Alarm today.